I’ve been trying to “weigh” our pigs weekly, with a weight tape. The weight tape is awesome for lazy kids like myself that don’t want to walk our pigs out to the scales, or for people that don’t own a scale. It’s not 100% accurate like a scale, but it gets pretty close. Since I’m not making a business out of these pigs, I’m not that concerned with with being perfect. This pig project is purely for fun, education and good food, for me. This is a weight tape. They have them for cattle and stuff too. That brings us to the point of this post! Giveaway time!!!! As you may or may not know, my Mom makes soap. The old timey, lye based, goats milk, soap. In her kitchen, using recipes she has honed over the past 15 years. It is the most amazing soap ever (I’m not just saying that because I am her kid, they really are amazing soaps). My Mom offered an 3 pack of her soap to the person that can guess the average weight of the piggies! Mom’s homemade goat’s milk soap.The prize! And what a wonderful prize it is! This is the deal – my Dad and I are going to go weigh the four red wattle/tamworth pigs and average the weight. If you want to win the soap all you have to do is leave a comment with how much you think the average weight will be, pretty easy! Good luck!!! I will be announcing the winner tomorrow! And sending them the soap on Wednesday the 2nd! I’ve realized it’s been a few weeks since I’ve done a pig update. I’m sorry!!!! Let me fill you in. We are still having problems with Harry Houdini pig, oops, I mean Char. When Char was a wee piglet he taught himself to escape the pig pen. He’d go hang out with my Dad and get treats. It was funny and cute to me for a long time until I started tripping in his holes. And then Dad started tripping in his holes. Now we are trying to fix this problem. This is what Char escaping his pen looks like. I thought it was funny until I was taking a plate of prime rib home at night and tripped in one of his rooting holes. The prime rib was ok, but the au jus was a goner. If you know me, you know how serious I am about my au jus. Dad got into his pole collection for us…. And added those poles around the bottom of the pen so Char couldn’t slip under the fence. This is what a sad pig looks like when he figures out he can’t escape! We have continued cooking slop for the pigs, I’m really getting it down! Sam from the Cardinal Rules blog had the brilliant idea of putting a lid on the slop as it cooks, therefore cutting my cooking time! I had one of my twitter friends tell me about a study they did where they gave pigs beer to see if it would lower their stress levels. Pigs like beer! Like I mentioned before, I was able to get these pigs by promising that I would pay for and take care of everything and my parents would get a freezer full of pork out of the deal. Well, it hasn’t really worked out like that. It’s now adult 4-H/Parent’s having fun. They drove to Orland to buy us cheaper/better slop cooking materials. So nice of them! And the last pig pen improvement is a concrete feeding station!!! My parents surprised me when I got home from work – isn’t it awesome!? And there you have our latest pig update. They are fat and happy, and getting more so everyday! It was a big weekend for me. After years and years of talking about it, I finally went to the Renegade Craft Fair in San Francisco. The level of excitement I feel when I go to the City must be what people who are interested in farming feel like when they get to go to a farm or ranch. It’s a big deal. The night before I couldn’t sleep because I was so excited! I had already lurked at the booths I wanted to buy things from, planned my route down there, had toll fair already in my car and arranged for the other member of Adult 4-H to feed the pigs that evening for me! I usually can make it to San Francisco, play for the day and come home in one day. It’s a lot of driving but it is definitely do-able. We left the Ranch bright and early, therefore missing almost all traffic, we made excellent time, despite a coffee, breakfast burrito and poop stop (the essentials). There it is……. I made it! The Craft Fair was held at the Concourse Exhibition Center, which is right off the freeway, so I didn’t have to do too much city driving. Driving on anything with more than 3 lanes, is kinda scary for me, we simply do not have that where I am from. Despite my best efforts I was simply not prepared for the craftness Mecca that is Renegade. Imagine pinterest and esty had a very large, hipstery, love child. That is Renegade. Here is the thing. I did some Christmas shopping while I was down there (I can only make my family and friends homemade stuff for so long before they get sick of it), so I can’t show you my favorite things until after Christmas. However I did get to see Drywell’s booth, which was super awesome, she is one of my favorites. This is made out of spent bullets casings, that were melted down! My Grandpa left me a pistol when he died, it’s amongst my most treasured possessions and this reminds me of it. Some of my favorite Ranch memories are of shooting and hunting. My Dad taught me this skill fairly early in life, so oddly enough, this is something very meaningful to me. Renegade was incredible, I’m so glad I went! Fair warning though, if you don’t like crowds, don’t go. This is a very popular event and several times during the day I felt like a cow caught in the middle of the herd, all I could do was just go with the flow. I went over the Golden Gate, it was rainy and kinda scary, but I wanted a picture for this blog! Since I was in San Francisco I had another mission. Crab. Dungeness crab. Being cattle ranchers, fresh seafood is a delicacy to us, especially to my Dad. Crab is my Dad’s favorite, I think it means a great deal to him when he gets it. I used my social media network to find the freshest, best crab possible. I wanted to find crab that was alive until I picked it up. Enter Western Boat and Tackle – I called them while we were still in San Francisco and by the time I made it to their shop they had my perfect crab all ready for me! My day trip to San Francisco was awesome. I got most of my Christmas shopping done, I had a fun adventure and I got to bring neat things to eat home, a complete win in my book! Both my cat (Jack) and my Parents cat (Ozzy) have a passion for crab. They were pretty happy with me. I’m sure you won’t be surprised when I tell you, we love our piggies! It’s been a kick in the pants having pigs again. They are fun to watch, they are fun to interact with and they are going to be incredible to eat. The one downside to having heritage pigs is they take longer to feed and finish compared to commercial pigs. This means that our feed costs are becoming rather significant. We did plan for this and we knew to expect it so it’s not a shock to us. However, since my Dad has a lot of experience with raising pigs, he suggested to us that we make our own pig food. Since these pigs are for our own consumption, and will be custom exempt slaughtered, we can make our own pig food! 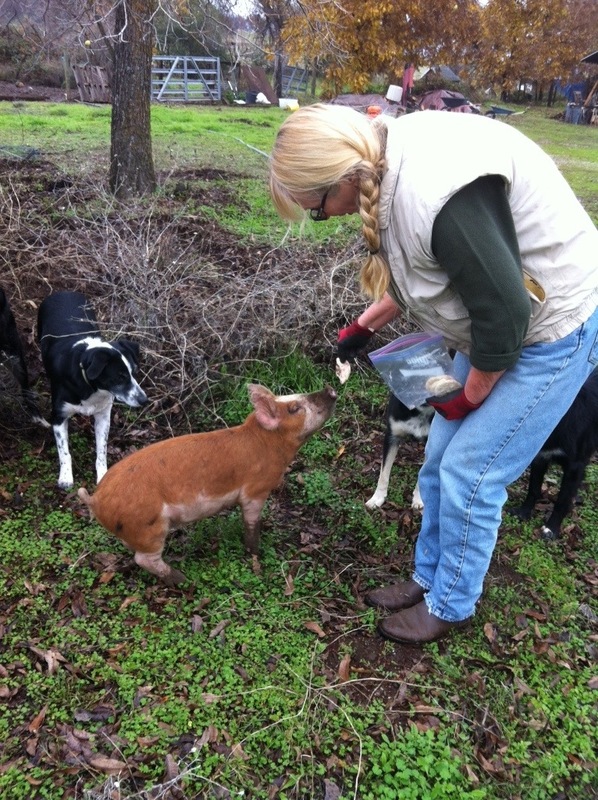 This weekend we had an adult 4-H meeting where we made hog food and de-wormed our pigs. Rene was kind enough to give us her pumpkins she grew! Thanks Rene! We used rolled barely, milk, water, pumpkins and leftover vegetable waste from our kitchens to make the food. Next time we want to incorporate some rolled corn too. Crystalyx containers are pretty much the best thing ever. I use them for everything. In this case a cooking container! (These are what our cattle’s supplements come in). I come from a long line of pyromaniacs, pretty much any excuse we get to play with fire, we take it. What can I say, I love to make s’mores! Mahina and the Intern got a nice hot fire going and added water to boil. I have a great fire ring in my front yard that we were able to set the tub on in order to cook our food. I might have had too much fun doing this. Maybe. While the food was cooking, we de-wormed the pigs. We used an oral paste that we tricked the pigs into eating by placing the paste in oreos. The pigs had no idea! After a couple of hours the barley expanded and smelled wonderful! The whole Ranch smelled like cooking pumpkin oatmeal and campfire, it was dreamy. Mmmm, mmmm good. Homemade pig food! How did it turn out? Awesome. It was cheaper than the pig food we’ve been buying at the store, we are able to use food that would normally be wasted, and it was a lot of fun. Best of all? The pigs LOVE it! They ate their normal amount and screamed at the fence until I gave them more (yes, the pigs are spoiled). We’ve decided that we will now do a bi-weekly campfire cookout for the pigs. Like I mentioned above, we are going to try different recipes and see what the pigs do best on, and take it from there. Stay tuned!